The 104th Sonic Channel wallpaper for June 2011 – Sonic’s 20th birthday month is a rarity in that it features another character who is celebrating twenty years. 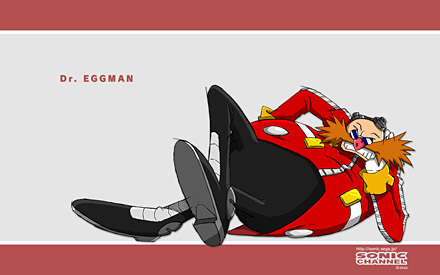 Be it Eggman or Robotnik (hint: it’s both – freakin’ deal with it) the fat ol’ scientist has as much right to celebrate his birth as Sonic. So it is perhaps a nice touch that he gets the duke for only the fourth time since Sonic Channel started doing monthly wallpapers. Whilst this his only his fourth wallpaper, for Dr. Eggman it is the second in a very short space of time, as a 2010 sketch varient appeared in Novemember 2010. However Dr. Eggman is also the main series character with the longest wait between wallpapers as the other two were back in August 2005! Head on over to the Sonic Channel wallpapers page to pick it up.